If you do a study on what happened to the New Testament disciples and their followers, you quickly realize what a sacrifice has been made for us to be able to exercise our Christian faith in the 21st century. The early years of the Christian movement were perilous and deadly times. How the gospel survived those early years can only be attributed to the fact that God ordained it and the hard choices and perseverance of the saints that were charged with carrying the torch to the the next generation. Over the ages, thousands have paid the ultimate price so that the gospel could be brought vibrant and intact to us in the twenty first century. Most modern day believers don’t give much thought to the past and how and why we are able to freely worship today as Christians. Our study of the faith is focused inward and centers around obtaining inner peace and personal satisfaction in life, with little thought given to the history of those who selflessly brought the faith to us. Whether we realize it or not, we are standing on the broad shoulders of those who have come before us. We have a heritage that we must acknowledge and actively be aware of. If we forget where we are from, we will definitely lose sight of where we are going. We also have a responsibility to keep the torch lit and pass our faith along to those who come behind us. Let’s take a brief look at the shoulders we are now standing on. First of all, where we come from matters to God and He put us in a natural family as well as a spiritual family as part of His master plan. Heritage was God’s idea and it is evidently very important to Him. The Book of Genesis carefully lays out the beginnings of the Jewish nation and covenants that God made with his chosen people. From Adam and Eve, to Noah, to Abraham, the lineage of each is carefully recorded. Later, when God calls Moses in the Exodus story, He tells him in Exodus 3:4-6, “I am the God of your father, of Abraham, Isaac and Jacob”. Isaiah 51:1-2 tells us that we are to look to the rock from which we were cut, to look to our Jewish roots (Abraham and Sarah) if we want to seek Him. In the Book of Numbers, chapter 1, God list all the families and their households to preserve their lineages and heritage for all the generations to come. Moving to the New Testament, the first seventeen verses of the first book, Matthew, list the genealogy and lineage of our Messiah, Jesus. Hebrews 11 lists all the Old Testament saints and martyrs who have gone before us and paved the way for those that would come later. Hebrews 11:33-40 details the difficult circumstances that believers faced because of their unwavering belief in the God of their fathers. The fulfillment of their faithfulness and perseverance was realized in the person of the the Messiah, Jesus. Jesus was the ultimate example in suffering and endurance (Hebrews 12:1-3) and His discipled followed his example to the point of death. They carried the gospel message forward for 2,000 years to each succeeding generation. Though persecuted and pursued, they were faithful to pass the torch on to us. We are standing then on some very broad shoulders. A tremendous price has been paid by our forefathers that have gone before us. Have you ever given any thought to whose shoulders you are standing on? Who in your lineage (family or spiritual) has been responsible for showing you the way to the Messiah? Also, what are you doing to ensure that the legacy is being passed on to those in your family? God has given us the responsibility to pass the legacy on to the family that He has so carefully placed us in. We must be the shoulders that the next generation stands upon. Where will the next generation of leaders come from if we don’t carry our our responsibility? Who will be standing on your shoulders? We finished our first lesson with God creating a new space where He could dwell with His creation. After the Fall, God and man were separated from each other by sin. The tabernacle would be the new place and the new space where God could reunite with His people. As the intersection of heaven and earth, the Tabernacle was a constant reminder to the Israelites that God was with them as they traveled the wilderness and entered the Promised Land. Later, God had them build Him a permanent space when they constructed Solomon’s Temple in Jerusalem. However, the prophet Jeremiah prophesied that in the future there would be a time when all of this would change. In Jeremiah 31:31-34, it says that God would change the old sacrificial system that was outward and put it in the hearts of the believers. Verse 34 finishes by saying that God will forgive their sin and remember their iniquity no longer. In both the Tabernacle and the Temple, God said through the Temple ceremony sacrifice, “Your sins are forgiven”. Only God could forgive sins; forgiveness was only found at God’s house, the Temple. Fast forward nearly one thousand years until the time of Jesus’ coming. Jesus was with His disciples in the Galilee, ninety miles from Jerusalem and the Temple. Mark 2:1-12 tells the story of a lame man that four of his friends brought to see Jesus. They couldn’t get to Jesus because of the crowds, so they cut a hole in the roof and let the lame man down into the room in front of Jesus. When Jesus saw their faith, he said to the man, “Son, your sins are forgiven”. Immediately, the teacher of the law said that this was blasphemy, “Who can forgive sins but God alone?” They were saying, you can’t do that! Only God can do that and then only at the Temple. Can you see the paradigm shift here? Jesus said to the teachers of the law, “The Son of man (Jesus) has authority on earth to forgive sins. I am the new Temple – I can forgive sins! I am where heaven and earth meet!” There are several other places in the gospels where Jesus told his listener, your sins are forgiven (e.g. Luke 7:48-49, where the listeners said, “Who is this, who even forgives sins?”). In fact, what ultimately led to Jesus crucifixion was that He was messing up the Temple system. He was doing what the Temple was supposed to do and that was a huge threat to the Sadducees and Temple authorities. God never intended for the Temple in Jerusalem to be the final answer to God dwelling with His people! Jesus was resurrected and went back to heaven and is seated at the right hand of the Father, so where is the Temple now? Where is that space that God inhabits and where heaven and earth meet? Where do people come to have their sins forgiven? Because of what happened at Pentecost, we, the body of believers (1 Corinthians 3:16), are the New Temple (also Ephesians 2:19-21)! God came out of His old house at Pentecost and is now dwelling in His new one! We (the church) are where heaven and earth now meet! He wants His presence to be us! We are the body and bride of Christ! There are a lot of people out there that need forgiveness of sins and the church should be the place where those sins can be forgiven. We can say with authority from Jesus himself, to someone, “Your sins are forgiven if you believe on the name of Jesus Christ” (John 20:23). In our churches and in our daily lives we are supposed to be creating a space where God lives, so that when homeless, abandoned or hurting people come in they find the presence of God. When your grandkids come over, is there a little slice of time and space where heaven and earth meet; where they feel loved, protected and forgiven? In our church meetings, do the unclean and the unforgiven find welcome, acceptance, and absolution? We are the New Temple and we are the place that God wants to inhabit! He wants us to be the place where heaven and earth meet. Our heart is that space that God inhabits, where He dwells with His people. What God began in the Garden of Eden, with his desire to dwell among (tabernacle; John 1:14) His creation, He completed by sending His Son and His Holy Spirit to dwell within us. When God first created heaven and earth in Genesis, they were both the same place. If you read the creation story, it does not talk about two distinct places where God lived and man lived. For example, the tree of life, which signified life without death, was located in the middle of the garden of Eden (Gen 2:9). This same tree of life is pictured in Revelations 2:7 and 22:2,14 as being in the new heaven at the end of the age. In Eden, God created a space where He could live with His creation. His perfect intention was for His people to dwell in His place, with full access to His presence. In Genesis 3:8, God was walking in the garden with His creation. It doesn’t say He came down from somewhere else to visit, it implies that He was there, his presence was with His creation in the garden He had created. Because of the original sin of Adam and Eve, God was forced to drive them from the garden of Eden and put cherubim and a flaming sword to guard its eastern entrance and keep his creation from entering (Genesis 3:23). God was holy and could not live where sin was, so He had to separate himself from His creation. The only hope that man now has is that God would have mercy and somehow redeem His fallen people that are separated from Him by the chasm of sin. The story of Eden is where the redemptive thread in the Bible begins. Who will pay the price for Adam and Eve’s rebellion? How do we get Eden back? The salvation story begins not with Jesus, but with Adam and Eve. Because of His infinite mercy, God did not give up on his desire to dwell with His creation. In Exodus 25:9, he told Moses, “Have them make a sanctuary for me and I will dwell among them”. In this verse, you can hear the echo of Eden. God wants to live with His children again, so he has them build a sacred place where once again heaven and earth can meet and be one and the same. Notice the similarities of the Tabernacle to the Garden. The entrance to both is from the east (Genesis 3:24 and Exodus 26). Both were guarded by cherubim (Genesis 3:24 and Exodus 26:31-33). God placed the tree of life in the garden (Genesis 2:9). In the construction of the Tabernacle, God told the craftsmen to build the menorah to resemble the tree of life, with buds, blossoms, branches and fruit (Exodus 25:31-39). The tabernacle was erected on the first day of the New Year (Exodus 40:17) to signify a new beginning between God and His people (see also Creation Story in the Tabernacle). Heaven and earth could now meet in the Hoy of Holies where God lived in the Tabernacle. Time and space would meet here where God would forgive the sins of the people through the sacrificial system He put in place. For one small moment, the Garden of Eden would be back, sins would be forgiven, and worshipers would experience what heaven is like. God would be living with His people again. It is interesting to do a short study on the clothing that Jewish men would have worn during Jesus’ day and then to ask ourselves if the mental pictures that we have of Jesus matches our findings. What did Jesus and the other Jewish men in Israel wear and look like and how does that add to our knowledge of Bible stories when we understand the Jewish customs of that time period? As usual, the more we know about the culture of the Bible the more alive the Scriptures become. Jewish men during the time of Jesus wore two garments for every day use. The first one, a linen undergarment or undershirt, was called “haluk” (or chaluk). It was long, like a night shirt and fell halfway between the knees and ankles. You wore this garment at home, or to work in, but not in public. Mark 14:51-52 describes a young man (probably Mark) escaping from the soldiers and having his haluk ripped off, making him naked. The fact that he only had his undergarment on suggests that the disciples were sleeping somewhere nearby when the soldiers came to arrest Jesus. Also, in John 19:23, the soldiers gambled for Jesus’ haluk, his linen tunic, at the crucifixion. Because of Numbers 15:37-41, Jewish men always wore tassels on the corners of their tallit. The tassels were called, “tzitzit” (pronounced seat-seat) or “tzitziot” (plural). 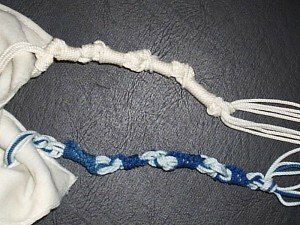 There were to be four tzitzit, one on each corner of your robe, and each tassel was to have a blue cord in it. The blue cord represented royalty. The tassels were to be a visual reminder of God and His commands and His authority. 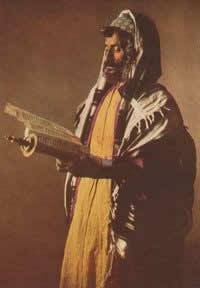 The corner of the robe with the tassels on it was called, “kanaf”or “kanafim” (plural). This Hebrew word also meant, “wing”. Two Bible stories come to mind that involve the corners and the tassels on them. The first one is the story of David and Saul in 1 Samuel 24:1-4). David cut off the corner of Saul’s robe in the cave where David was hiding. David was not just cutting off a piece of Saul’s robe. By cutting off the kanaf and the tassels (tzitzit) that symbolized God’s authority and protection, David was saying, “God has taken His hand off of you and you no longer have His authority on your kingship.” The second story concerning the tassels is in Matthew 23:1-7, where Jesus criticized the Pharisees, not for wearing tzitit, but for making them extra long. It is interesting to note the effort to which Jewish people would got to tie their tassels in a certain way. There were were eight strings on each tassel and five knots were tied in the cords. The five knots represented the five books of the Torah and the four spaces between the knots represented the four letters in God’s unspeakable name. Also, the Hebrew language attaches numeric value to each letter in their alphabet (e.g. echad, the first letter in the alphabet corresponds to 1). The numeric value of the Mishnaic spelling of tzitziot is 600, and if you add to that the 8 strings and 5 knots, you get 613, or the total number of all the oral laws in the Mishnah, or all the laws of Moses. The detail to which they went is an example of their devotion to their God. During New Testament times, tzitziot took on and additional and more important meaning. As the Jews began to look for the Messiah, prophets began to give clues as to what attributes the “coming one” would have. In Zechariah 8:23-24, it was prophesied that the Jews would take hold of the Kanaf of the Messiah’s robe because they had heard that God was with Him. Also, in Malachi 4:2, it declares that the coming Messiah would have healing in his Kanaf (wings), which, if you will remember, is the same word as the corners of His robe. The Jewish people knew that the Messiah’s tallit and tziztit would be special. One other subject that we could discuss would be the phylacteries or boxes (called, “tfillin”) that the Jews of Jesus’ day put scriptures in and then wore on their foreheads to remind them of the command that God gave them in Deuteronomy 6:8. Would Jesus have worn a tfillin? Have you ever seen a picture of Jesus that had him wearing tassels or tfillin? The main conclusion that we can draw is that Jesus would have dressed like the other men of his day and would have fit into the customs of His Jewish peers. He was Jewish to the core and did what the Scriptures and His traditions told him to do. Because we look at the Bible from a 21st century perspective, and because our mental picture of Jesus often comes from a Middle Ages era European artist’s depiction of Him, our ideas of what He looked and dressed like are skewed. Once again, learning about the culture during Bible times doesn’t necessarily change the story, but it sure gives it more depth and meaning and this study of Jewish custom and dress is a perfect example.